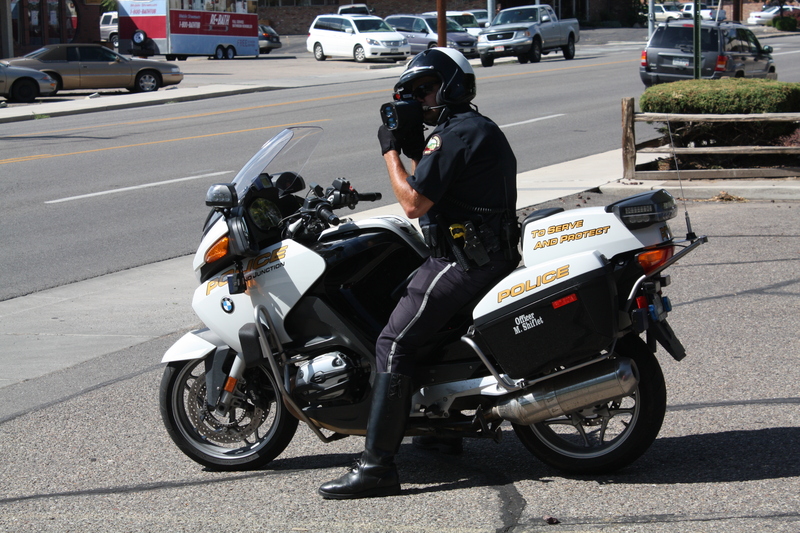 A GJPD Traffic Officer looks for school zone speeders on 7th St. Flashing yellow lights will be joining red and blue as school zones become active again for the new school year. Students across Mesa County are returning to school this week, and that means officers and deputies will be watching for speeders in school zones. This year the new school zone at Caprock Academy in the 700 block of 24 ½ Rd. is included, where the speed has been reduced from 45 miles per hour to 25 miles per hour during posted arrival and release times. Instead of flashing lights, the Caprock times are printed directly below the school zone sign. School zones are an important tool when it comes to keeping our kids safe. Because of this, the Grand Junction Police Department and Mesa County Sheriff’s Office have zero tolerance for drivers who ignore the posted signs and don’t slow down in these areas. We also ask drivers to be alert for kids walking and riding bicycles to and from school, regardless if they are in a school zone or not. Have You Seen Jonathan Kelley? Is there anything GJPD can do about a truck parked a couple blocks from an elementary school with a decal filling up the back window saying “Man S#it!!”? My kids go by this vehicle a couple times each day. The F-150 is parked at B 1/2 and 28 1/2 Rd. The plate # is 797 PNA. I normally do not complain about mild obscenities, but this is outrageous!